As a part of her legal work she specialises in international private law and also helps represent clients before European institutions. She also gives legal advice on commercial and civil law. She has long experience of the provision of advice on property law, at both the private law and public law levels. For more than ten years she has been working with a number of building control authorities, to which she provides legal advice and for which she drafts legal opinions and analyses. She is a member of the Czech Law Society and the Czech Construction Law Society. Pavlína Uhlířová studied at the Law Faculty of Masaryk University in Brno from 1998–2003. In 2010 she passed her law doctoral examination at the Charles University Law Faculty, International Private Law Department, defending her thesis on the topic “Franchising in International Private Law” and obtaining the title JUDr. 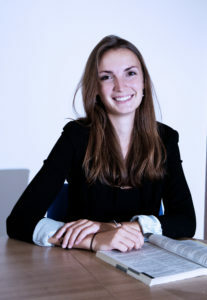 In 2015 she completed a second doctorate at Charles University Law Faculty, defending her thesis on the topic “Position of a Person of Unknown Residence in the Light of the Brussel I Regulation” and obtaining the title Ph.D. In his legal work Matouš Vrběcký focuses mainly on law of contracts, both civil and commercial. He draws up contracts for both entrepreneurs and other legal persons. He has experience in business corporation law, mainly in relation to capital companies. Matouš Vrběcký also focuses on real rights, primarily with respect to real property. He has experience in intellectual property law, both in copyright law and industrial property law. Matouš Vrběcký studied at the Law Faculty at the Charles University in Prague in 2011–2016. February 2014 – September 2016: work experience, attorney JUDr. Pavlína Uhlířová, Ph.D. He speaks English, French and Russian. Tereza Ciupková is a student of the Faculty of Law of Charles University in Prague. She focuses mostly on an international and foreign law and the protection of fundamental human rights. As part of her studies she completed an internship at the Embassy of the Czech Republic in Chile and a participated at one year study abroad program at the Universidad de Córdoba in Spain. From August 2018: work experience, attorney JUDr. Pavlína Uhlířová, Ph.D.
Pavel Sýkora is currently studying the Law Faculty of Charles University. He is interested in civil law (alternative dispute resolution), company law a electoral law. He visited an external seminar organized by the law faculty and he wrote a paper about ombudsman. He is a member of Common Law Society, student college association. In the past, he organized a few seminars and meetings about legal themes.